Graphic courtesy of Idaho State Legislative Services Office The map above represents the first and only official proposal for revised legislative district boundaries. The existing District 25, labeled 26 above, would include all of the current district plus part of Twin Falls County north of Buhl. Despite legislators' statements that they want legislative District 25 to retain its current boundaries, a new plan does change the shape of the district, adding more than 2,600 primarily Republican-leaning voters. The citizen Commission for Reapportionment, the six-member bipartisan group responsible for drawing the lines of Idaho's legislative districts, met late last week and early this week to discuss how to divvy up the state. State code requires district lines to be redrawn every 10 years in accordance with the most recent census data, to keep district populations approximately equal. Democratic Commissioner George Moses presented a legislative district map on Tuesday that includes 35 legislative districts, the same as the current number, and does not split Blaine County. It does, however, include part of a divided Twin Falls County along a line just north of Buhl, adding 2,641 voters to the district. Rep. Donna Pence, D-Gooding, said that while she preferred the current district boundaries, the new plan is workable. "I can live with it," she said. The main challenge would be contacting the voters in the distinctly rural area, she said. Town residents can be easily accessed by main roads and through town meetings, but Pence said the best way to contact residents in this area would be through the mail. "It's really difficult to contact them," she said. "I would assume they don't get a lot of attention from their present representatives for the same reason. It would be an added challenge to really get to know those folks." Pence said the change is unlikely to threaten any currently seated district legislators. "It'll make [the races] tighter," she said. "But if you're doing a good job and you're out there working for folks, they'll vote for you." The plan does split five other counties—Bonneville, Bannock, Twin Falls, Canyon and Bonner—while taking one precinct from Teton County. 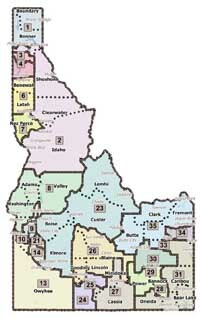 This removal makes Teton County and Madison County the correct size for a district. The total population deviation for the plan is 9.82 percent, within the 10 percent allowed by Idaho code. State law requires it to have 30 to 35 districts of roughly equal population. As a result of the 2010 census, districts' populations need to be between 42,549 and 47,027. Under the proposal, Blaine County's new district would encompass 45,806 people. Five plans for new congressional districts were voted down on Tuesday following partisan wrangling. Republican Commissioner Lou Esposito described one plan, C-38, as a compromise, but it failed with three Republican "yes" votes, one Democratic "no" from Moses and two abstentions. The plan used I-84 as a dividing line between districts, splitting Ada County. The county has been split between congressional districts since 1971. Under this proposal, no other counties would be split, and every county in the state would remain in its current district. The congressional district debate was unresolved as of the commission's adjournment on Tuesday, but will be revisited on Monday when the commission reconvenes. The commission announced during a public hearing in Hailey last month that its goal was to complete and file all plans by July 27. Cydney Gaudet, assistant to the commission, said the commissioners were still aiming for the early date but she could not say whether they would meet it. Final plans must be filed by Sept. 4. or the maps will go to the Idaho Supreme Court for a ruling.